Greatshield given to those who resisted the curse long ago. Far too heavy for an ordinary person, perhaps it signifies the foolishness of resisting the curse. And yet, those who bear the weight of this shield will not find its protections against curses wanting. 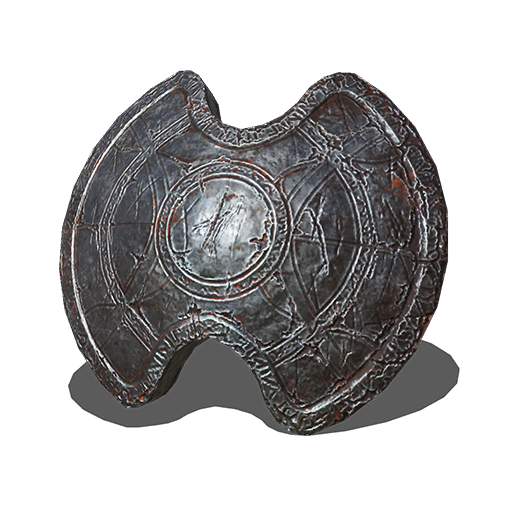 Equipped this shield in the left hand allows one to perform the Skill of the right hand weapon. Found on a corpse in the mausoleum just before the large doors of Cathedral of the Deep. Guarded by a Cathedral Grave Warden. Returning Dark Souls II item and was called the Pursuer's Greatshield. The Pursuer was an undead warden against the cursed undead. Soul-transposed weapon. Upgraded with Titanite Scale.